Ancient technology from the long long ago. The printer is the thing on top of the computer tower. The camera is the giant cabinet looking thing to the right of the monitor. We have something called a “gel doc printer” at my work. It’s purpose is self-evident. It prints documents of our gel pictures. Gel doc printers are used infrequently and often labs share them. Ours is shared between… probably five different labs? Maybe more. Taking pictures of gels is important in science. Gels are how we visualize DNA and proteins. A digital copy is good enough for your own records, but you need a printed copy in case someone claims your digital copy is edited. The gel doc printer provides that physical copy. Our printer is shared and an issue comes up that when the printer breaks we don’t know whose responsibility it is to fix it. Usually the breaks are fixed easily. A reboot of the printer or the computer will suffice. Not this time! 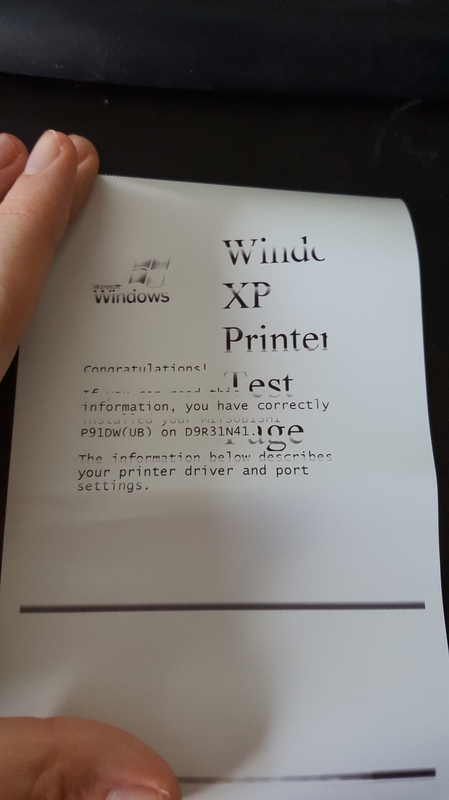 This time the printer has refused to print any and all images despite the computer recognizing it as a printer that is plugged in and printing test pages. Awful looking test pages, but test pages none the less. I delved into it and realized the printer’s driver’s were outdated. Normally this would be an easy problem to fix. Not so! You see, the computer the printer is attached to runs Windows XP which is no longer supported by Microsoft. An unsupported operating system can easily be hacked which means this computer can no longer be connected to the internet. If it was, hackers would have an easy access point to UC Davis’s systems. What that means is I couldn’t just download an update to the drivers like usual. I had to download the update on my laptop and then move it over to the printer computer with my USB drive. Okaayyyy… Move that on over. And that one finally installs! Moving backwards, the .Net Framework 4 installed as well. Along with the patch I got for that. Then the driver install program laughed at me and said it needed access to the internet after all. I tried installing the drivers on my own, but no luck there. I researched more on the problem. The printer is able to print out the very first part of all the images. Then it disconnects from the computer, reconnects, and decides the print job is complete. I found absolutely nothing on how to fix that problem. There were some suggestions that it was a problem with the connection to the computer, but switching the USB port used by the printer changed nothing. Maybe a new USB cable would do the trick, but I’m unsure if those are available for printers this old or whether it would fix the problem. For now, all the images are put on USB sticks and printed on different computers. 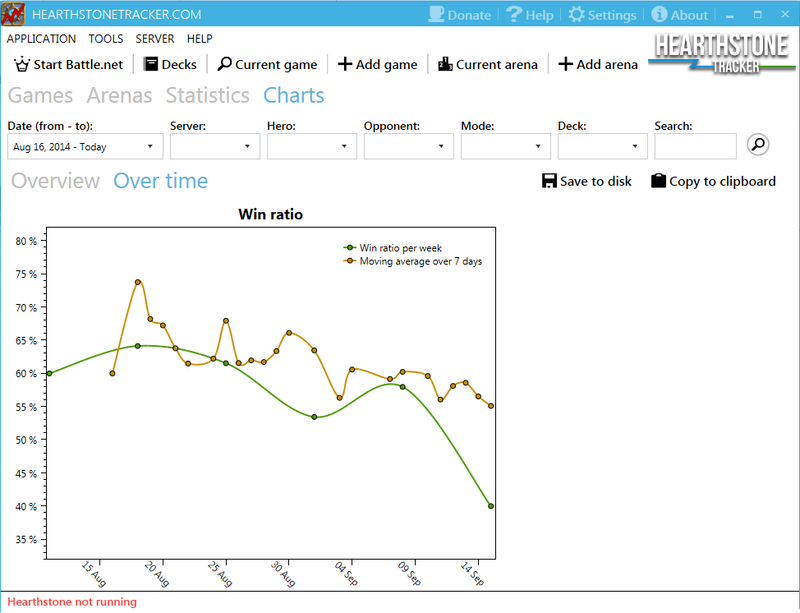 I got a program called HearthstoneTracker to generate some statistics on my Hearthstone matches. Do I win more against a certain type of class? Do I win more when I’m playing a certain class? Which matchups are favorable for which class? Which class have I been playing against the most lately? Do I win more often going first or second? Am I making enough money in Arena for it to be worthwhile? 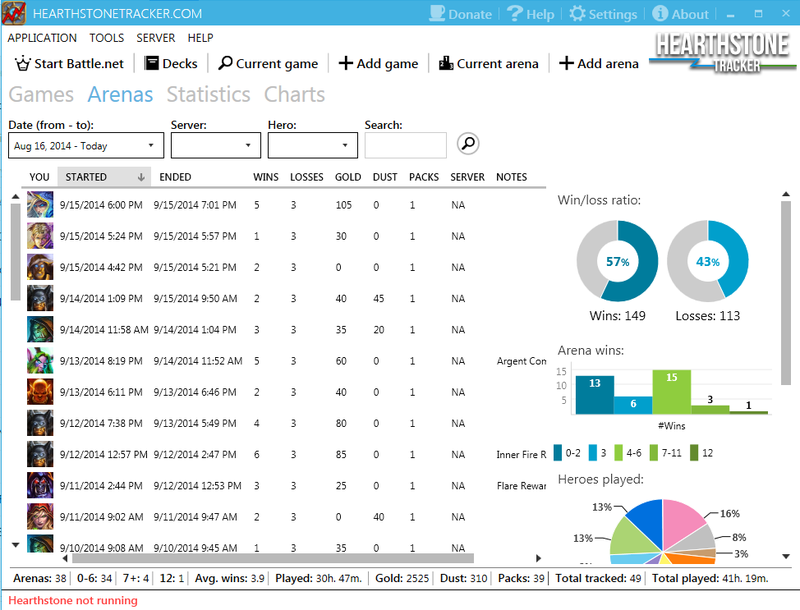 Hearthstone Tracker collects the data that I can then use to answer those questions. It even has graphs! I lost a lot of games on September 14th. And here you can see my win/loss rate is good, but not amazing. It’s a small download and it runs in a separate window while you play Hearthstone. You can minimize the window or even have the program stored in the tray if taskbar space is precious to you. The program may collect a lot of statistics but it has a few issues. Originally the program collected stats through a screen capture system. This is fine if you always keep the game open, but I like to do other things while I play (like writing blog posts). I created a workaround for that through a little bit of window feng shui. The program developer has since come up with a way to grab data from the stream going on to the internet or something. And somehow that method is even worse. I don’t know how it manages to get the length of a game wrong every single time, but it does. There’s an option to manually enter the times along with changing which class you played, which class you played against, how many turns the game took, etc. But who wants to do that manually? That’s why I got the program in the first place! Other than that it performs fine. It detects who won and who you were playing against. Ultimately that’s all that matters. The Tracker also has a neat feature after you finish an Arena run. You can manually enter your rewards and it keeps a running total at the bottom of the application. 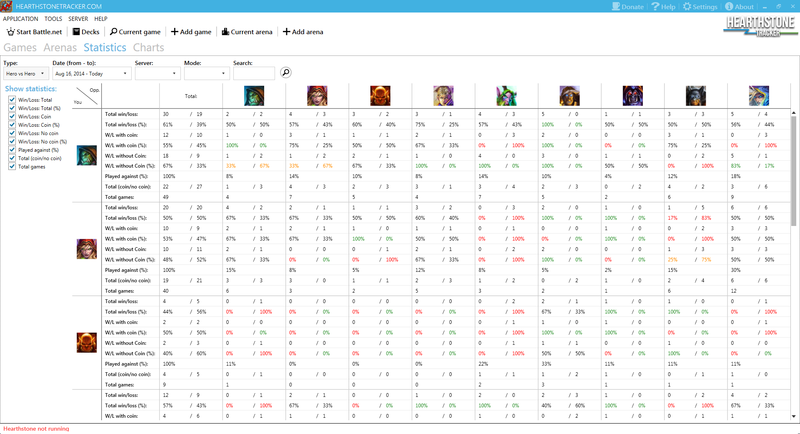 I’ve tested HearthstoneTracker against other tracking applications out there, Track-o-bot and HearthStats, and I found HearthstoneTracker to be the best one. If you’re interested in something that will keep track for you, I’d definitely recommend the little program! As I continue to develop more of Gurutama I’ll be making page links in the top bar for permanent information. Eventually those page links will be an easy source of information for myself, my players, and anyone else who wants to read up on our imaginary world. I’ll add more organization as necessary, but with only one link right now, I don’t think its needed. If you haven’t already seen it at the top, the Original Gurutama Timeline is now accessible. This is the unedited version which is probably filled with inconsistencies, timing problems, and other errors. I’ll be smoothing those out and posting a Revised Gurutama Timeline as I go. That’s pretty much it for today! Here’s a picture of a bear starting an exercise regime to make up for the lack of a real blog post. 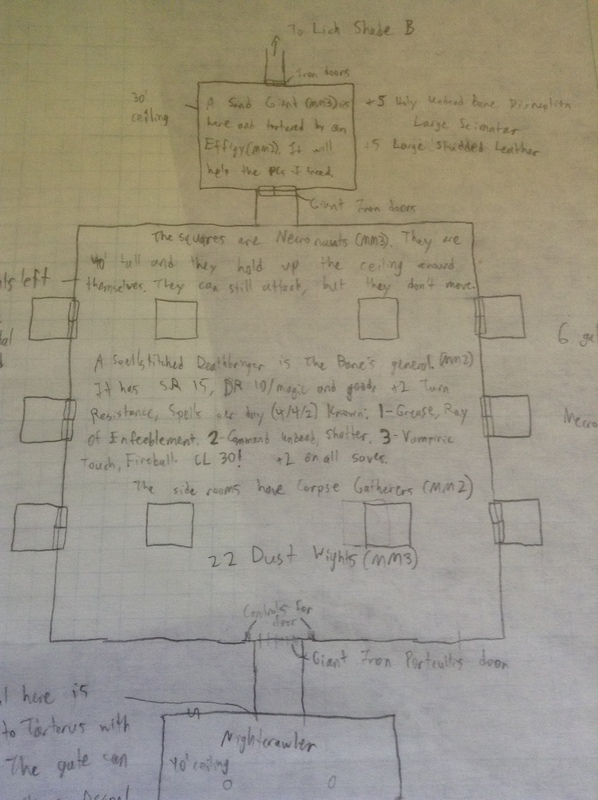 Room 2 of the Lich Shade dungeon drawn using graph paper with notes on it. There a lot of different styles of DMing in D&D and other roleplaying games. You can wing it and come to each session with very little prepared. You can come up with the adventure for each session in the week before. You can also do what I do, make up the entire campaign before starting it. Between each session I have almost no creative work to do for D&D. My campaign has been running for close to three years now and I’ve only had to design one adventure out of about a dozen since then. 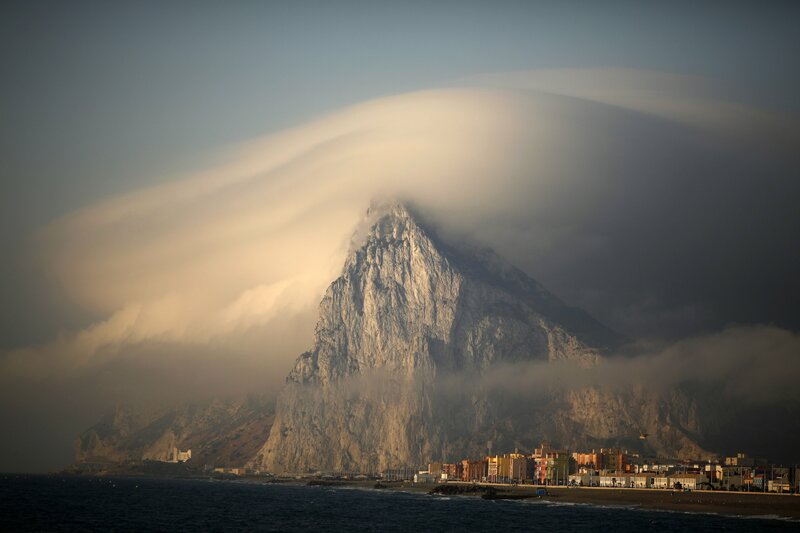 It’s nice. I don’t need to spend extra time on the game for me and my friends to have a lot of fun. I have started to run into a few issues though. When I wrote the campaign I imagined my group would still manage to meet in person. That proved to be horribly wrong. We have in person sessions about once a year now. When I drew all my maps they looked like the one pictured above. I’d make them on a piece of yellow-green graph paper. When they reached a room I’d draw with a wet-erase marker on a battle mat I brought to each session. When the players defeated the monsters in one room I’d erase and draw the next room. Dry erasing was easy, but creating good maps in our current system is a little difficult. My group now plays over the internet using an internet browser program called Roll20. Roll20 is really great. It has everything a tabletop has. You can even turn on a feature to see your dice roll across the table. However, I can’t just grab a pen and draw on my monitor as easily as I draw on the battle mat used previously. I suppose I could do that if I was used to creating digital images, but I’m not. Instead I’ve taken to making lame looking maps or using a cool mapping software piece called GridMapper. 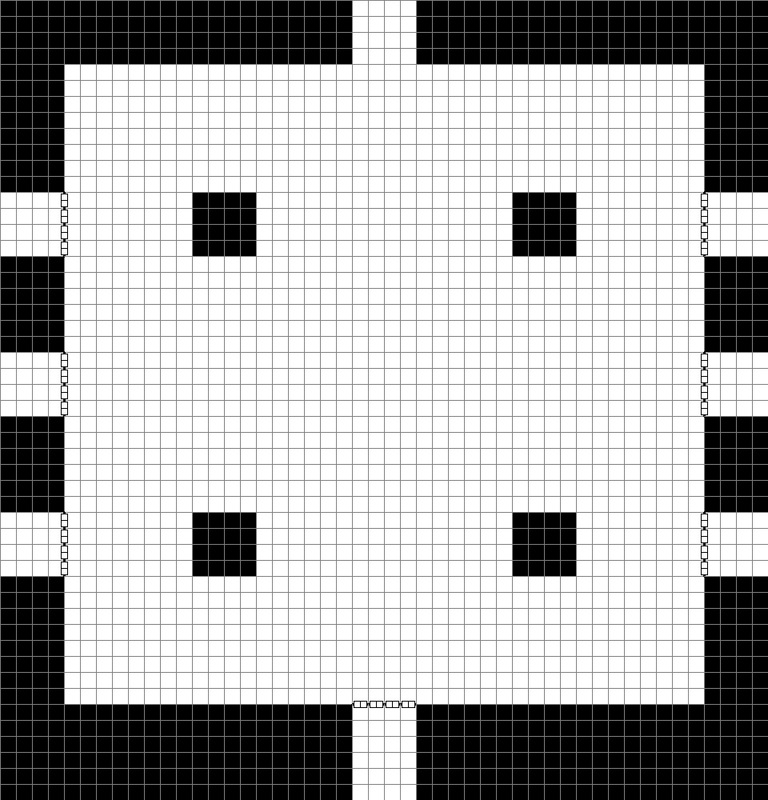 The second room of the Lich Shade dungeon made using GridMapper. GridMapper is extremely simple. You pretty much just click to change stuff. I can easily build maps in GridMapper. They don’t look amazing because it doesn’t come with preset images like trees and stuff, but they’re functional just like my dry erase mat. GridMapper has one issue, it has a maximum image size. Easy to get around though, I just make two images and glue them together for really big rooms. I’m slowly converting all my old pencil maps into GridMapper maps for Roll20 now.